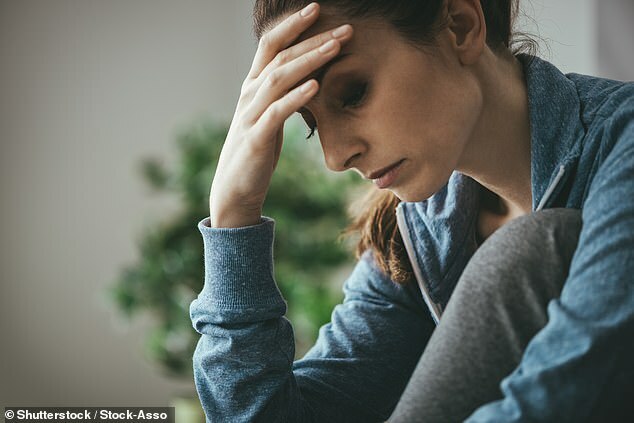 Depression, obesity and chronic pain could all be treated by targeting the same protein, research suggests. A study found blocking the protein FKBP51 in mice relieved chronic pain, boosted their moods and encouraged weight loss. This is the first time scientists have been able to target this specific protein without also affecting the function of others. Researchers hope their study will lead to new treatments in humans, with FKBP51 inhibitors also being tested in alcoholism and cancer. The research was carried out by the Technical University of Darmstadt, Germany, and led by Dr Felix Hausch, a professor of structure-based drug discovery. ‘The FKBP51 protein plays an important role in depression, obesity, diabetes and chronic pain states,’ Dr Hausch said. ‘We developed the first highly potent, highly selective FKBP51 inhibitor, called SAFit2, which is now being tested in mice. FKBP51 is expressed throughout the body, including in the brain, skeletal muscle tissue and fat. It also has multiple roles, from regulating the uptake of glucose to managing stress. This led the researchers to believe FKBP51 may be involved in the onset of numerous conditions. ‘I was intrigued by the peculiar regulatory role it seemed to play in cells,’ Dr Hausch said. ‘And there was a known natural product that could serve as a starting point. The difficulty was FKBP51 looks a lot like its ‘protein cousin’ FKBP52. ‘These two proteins are very similar in structure, but they are doing opposing things in cells,’ Dr Hausch said. ‘We have this yin-yang situation. ‘Selectivity between these two proteins is thought to be crucial, but this is hard to achieve since the two proteins are so similar. When mice were treated with SAFit2 – the lead FKBP51-inhibitor – they experienced less stress. The animals were also less likely to gain weight, which is thought to be due to them having a reduced appetite. And they had normal glucose levels and reduced pain as a result of treatment. Full results will be presented at the American Chemical Society Spring 2019 conference in Orlando later today. But Dr Hausch added much more needs to be done before SAFit2 can be used in humans. His team is also investigating FKBP51’s role in cancer after tests revealed certain glioblastoma tumours overexpress the protein. They hope FKBP51 inhibitors could be used when a patient’s tumour has mutated beyond what can be treated with existing cancer drugs. ‘We may be able to resensitise them to different types of chemotherapy using these specific inhibitors,’ Dr Hausch said.